What are some of your favourite LGBT YA books? Which books should I add to my TBR pile? 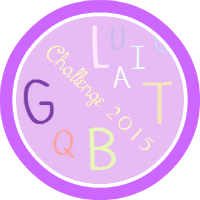 Will you be joining the LGBT Challenge 2015? From your list, I have read More Than This, Two Boys Kissing (great book! ), Every Day (will definitely read the sequel), Gone, Gone, Gone (loved it) and Simon (LOVED it). Thank you for hosting it, Cayce :) I'm doing very well so far for my LGBT reading this year :) I plan to tackle the rest of the pile soon.